Using the daily data collected through Kantar-GeoPoll Media Measurement, GeoPoll has analyzed the top TV stations in several states in Nigeria for the past three months, from July 1st – September 30th. 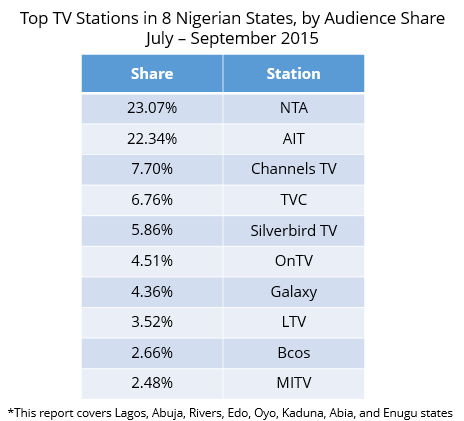 We examined both ratings* and share** for the top stations in the Nigerian states of Lagos, Abuja, Rivers, Edo, Oyo, Kaduna, Abia, and Enugu. The below chart shows the average ratings for the top channels during the day from 6:00 to 20:00. In these 8 states, NTA and AIT have high ratings throughout the day but interchange the top positions at different times of the day. AIT has higher ratings than NTA from 10:00 – 18:00, then NTA takes over, and has the highest ratings from 20:00 – 22:00. Channels TV has the 3rd highest ratings throughout the day, with its highest ratings during the evening prime time, followed by TVC. 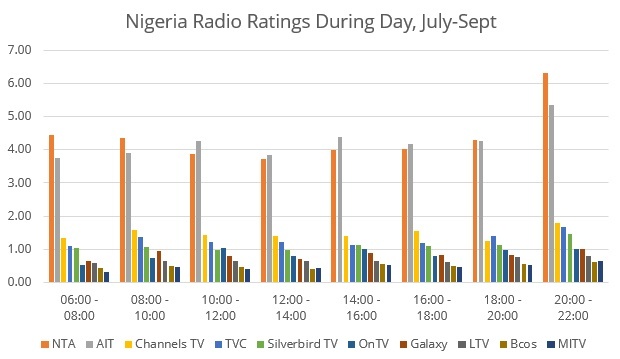 For more data on the TV, radio, and print ratings in Nigeria you can subscribe to Kantar-GeoPoll Media Measurement, which gives you overnight, daily ratings data with the ability to filter data by age, gender, location, and more. Click below to subscribe or contact us for more information.